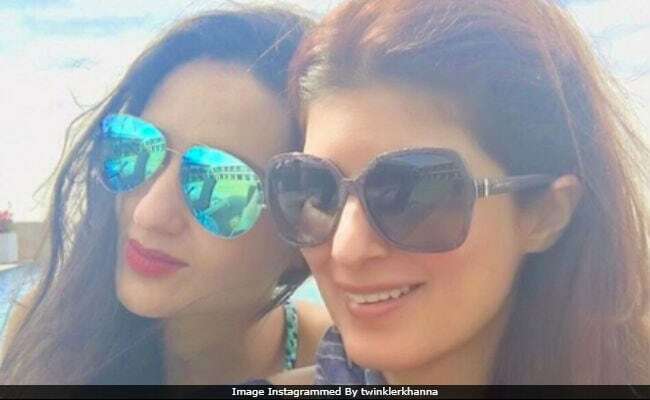 Twinkle Khanna spent a 'perfect' Sunday with friend Anu Dewan and their kids. She posted a couple of pictures from the day on Instagram and wrote, "A perfect Sunday = lazing in the sun, eating crab masala and watching the kids splash around," adding the hashtag, "Sun-kissed Sundays." (Twinkle's Sunday indeed looked just perfect). PadMan, her first film as a producer, released to positive reviews on Friday. The film is headlined by her husband Akshay Kumar and is based on entrepreneur Arunachalam Murugunantham, who invented low-cost sanitary pad making machines and created menstrual hygiene in his village. Here's how Twinkle Khanna's Sunday looked like. Meanwhile, Akshay Kumar flew to Delhi to attend an event. Akshay Kumar, 50, and Twinkle Khanna, 43, have been married since 2001. They are parents to son Aarav and daughter Nitara. PadMan is Akshay Kumar's first film of the year. He won the National Award for Best Actor last year for 2016 film Rustom. On Friday, an Akshay thanked 'superwoman' Twinkle for giving him PadMan and 'making the film a reality.' He posted an adorable picture with Twinkle and wrote, "The real #PadMan had his wife to thank for his story, so does the reel #PadMan. Full credit to this gorgeous superwoman for finding, chasing and making this film a reality. Over to you guys now." Of making PadMan, Akshay had earlier told news agency PTI, "I always wanted to work and make such films but I was not a producer during that time. I didn't have enough money but now I can. My wife told me about Muruganantham and then we met R Balki. So we thought about making this movie. Even Hollywood has not a film on sanitary pads or menstrual hygiene. People always make documentaries but they don't want to make commercial films. We have tried to do that." PadMan, directed by R Balki, has so far earned over Rs 23 crore at the box office. It also stars Sonam Kapoor and Radhika Apte in pivotal roles.